It is often called the “fast” protein which refers to the high speed of its digestion. The primary purpose of this product is to be an alternate source of protein. Its protein content may reach up to 70-90% depending on the brand, the remaining 10-30 % are filled with flavour-enhancing fats and lactose. What is the role of protein in my system? Protein plays the key role in the issue of weight loss. Whey protein isolate supplement is unique in that it does not contain any carbs or fats. If you attempt to get rid of fat deposits without simultaneous intake of proteins, then your body will experience a severe shortage of the latter. This is very important. It is obvious that almost any diet implies a sharp cut-back on meat, egg, farmer cheese and other sources of protein. So what choices are we left with? At best, there is oatmeal, buckwheat, vegetables, and so forth. None of these products is able to provide an adequate supply of such an essential building material as protein. Protein shortage manifests itself in thinner nails, hair loss and a whole range of health-related issues. 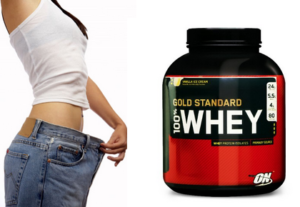 Therefore the best possible solution here is to take whey protein isolate to keep such troubles at bay. In addition to that, one of the major benefits of whey protein is that it is very nourishing. If you drink a specially mixed protein cocktail then you can effortlessly suppress your food cravings which is very important if you are trying to lose weight. If we consider natural animal-based products (meat, fish, milk, farmer cheese, eggs) as a source of protein, then beside protein you will also get fats and carbs which are contained in these products. For example, in order to get a required daily supply of proteins (150-200 g) from boiled chicken breast, you will have to eat about 2 pounds of it. 2 pounds of boiled chicken meat will get you roughly 30 grams of fat. Whereas you only need 200 g of whey protein isolate to consume the same amount of protein. By adding whey protein isolate to your menu you will be able to considerably enrich your diet with natural-based sources of protein. You simply needn’t eat the whole 2 pounds of chicken, 200 or 300 g will suffice and the remaining amount of protein will be provided by WPI. Important note! The body can digest no more than 30 g of protein at a time. In order words, if you consume 50 g of protein during a meal (natural or WPI) then only 30 g of it will be digested while the rest will simply go to waste. Protein is very effective for muscle growth – which has been attested by numerous independent studies. However, despite the fact that in some cases you can manage with common meat and dairy products, studies have shown that the use of WPI is preferable. Easy to store and to carry. L-carnitine is needed for balancing the burning of fat deposits. During the first three days of the program many people who take it experience irritation, hypersensitivity to the way their food looks and smells, some report problems with sleep. It should be noted that these three days prove to be rather tough for some people. This is probably the hardest period of the adaptation stage during which the concentration of fats and products of their breakdown in your bloodstream reaches its peak level. At this stage, the body will need a little outside help. That is why we turn to a completely harmless substance called L-carnitine. 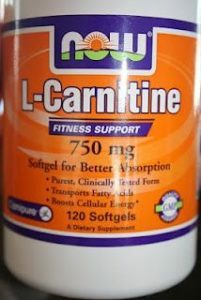 L-carnitine is one of the most popular supplements among those who strive to get their body into a slim and beautiful shape because they consider it to be some sort of magic pill. There are literally hundreds of different brands of carnitine which is advertised as an unrivaled fat-burner and an indispensable supplement for bodybuilding and aerobics enthusiasts. However, glycogen is only a temporary solution therefore when the energy consumption is high, more substantial sources are required. For their contraction our muscle cells are naturally programmed to use the energy released from disintegration of only one chemical substance – adenosine triphosphoric acid or adenosine triphosphate (ATP). The emergy energy reserves for production of ATP are represented by lipids, which are stored in fatty tissues. When the body energy demands are reduced and blood glucose values return to normal level, ATP along with carbs will be used to restore the glycogen reserves. Fatty acid molecules are transported to muscle cells where they are burned to release huge amounts of energy for the needs of muscle cells and for your own relief. It should be noted that carnitine does not engage molecules of fat in fatty tissues. Its activity is limited to muscles where fatty acid molecules end up after having been engaged. That is why it is of little use to take L-carnitine just as a common dietary supplement. L-carnitine is required only during the periods of sharp increase in the body energy consumption which is often the case with aerobic exercises. When our food intake is limited (especially during the first stage of the program) we cut to the minimum the consumption of natural protein which leads to interruptions in endogenous carnitine biosynthesis. Therefore, when fatty acids are actively absorbed into the bloodstream this can become a sort of barrier which interrupts the steady transportation of fatty acids through the membranes of muscle cells’ mitochondrions. Interruptions in fatty acid transportation lead to disruptions in their utilization or burning. The use of L-carnitine increases the efficiency of fat oxidation during aerobic exercises, which undoubtedly improves the overall state of the body and considerably raises our chances of achieving optimal results. L-carnitine should be taken in the following dosage: 1500 mg before and 1500 mg after an aerobic exercise. In total, this is just 3000 mg a day. It facilitates the release of energy from fat. In addition to that, it inhibits the ageing processes which are incidentally also related to the lack of energy. Coenzyme Q10 helps prevent many different health-related problems, especially cardiovascular diseases, and enhances the functioning of many important body systems. It is a wonderful cosmetic product with unrivaled results for skin rejuvenation. The coenzyme Q10 positive effect on skin has been clinically proven. Just a couple of drops are enough for daily application on your face in combination with any moisturizing cream. In a short while, your skin will become soft as silk and the number of wrinkles will decrease day by day. Coenzyme Q10 is a natural substance which is necessary for cell energy production which in turn stimulates the functioning of cells in deeper skin layers. It contributes to the body metabolism and enables regeneration in upper layers of skin which makes it firmer and smoother. Supplemental intake of coenzyme Q10 is particularly important because its content in skin cells sharply declines when the body experiences serious diet-related limitations and such a decline leads to certain distortions in skin structure. When going to a swimming pool or being at a beach you may have seen people who are trying to trim down their figure and who feature white scar-like stretch marks. In the summer sun they become especially apparent. This skin blemishes turn up due to hormone fluctuations and excessive stretching of upper layers of dermis (characteristic of sharp weight gains or rapid weight loss). Skin tissues become thin which provokes inner tears of skin, which subsequently are substituted with connective tissue and form scar-like marks. At first, such stretch marks are red or blue but with time the blood vessels in them stop working and the stretch marks turn white. The three most common body areas where they can be found are the thighs, belly and breast. This issue is particularly familiar to expecting mothers. The simplest way to prevent such skin manifestations is to supplement your daily diet with certain elements which visibly improve your skin’s resilience. Undoubtedly, you can’t go wrong with using coenzyme Q10 here. Any dietician worth his salt should be aware of this and should take this into consideration in his practice. In this respect, timeliness is fundamental because disease prevention and control requires a lot less effort then subsequent lengthy and often unsuccessful treatment of any neglected cases. It is rather difficult to replenish the balance of coenzyme Q10 when you are on a diet, because it can be found in food only in traceable amounts. In order to get the recommended 15-100 mg of coenzyme Q10 per day, it is best to use supplements which contain its ready-to-eat varieties. 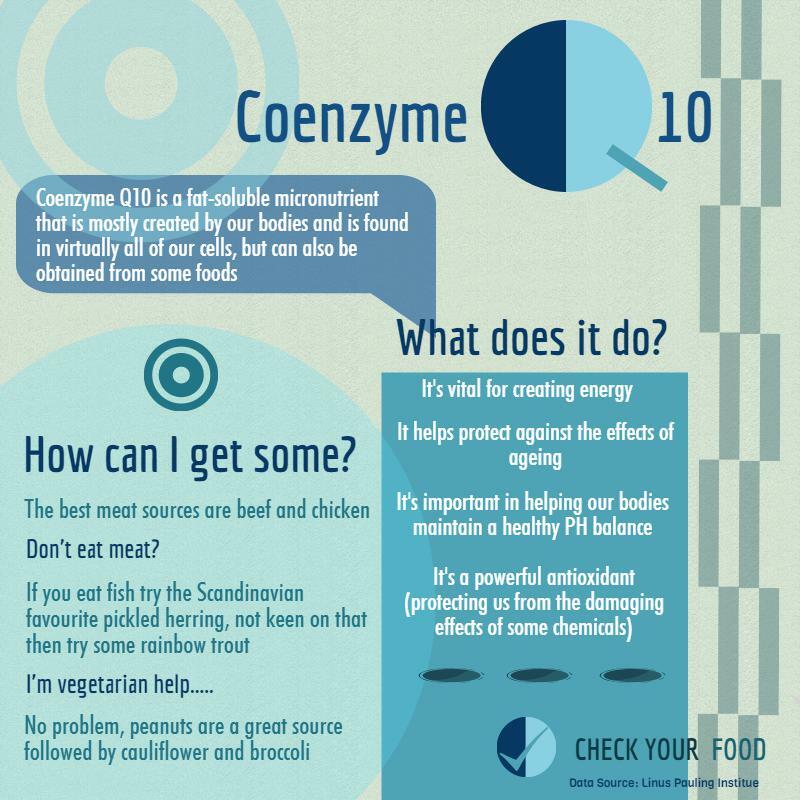 Coenzyme Q10 should be taken during meals so as to facilitate its absorption and digestion. It is easily dissolved in fats, therefore, its absorption can be considerably enhanced when it is eaten with food rich in fats, particularly vegetable oils with fatty acids Omega-3 and Omega-6 (salmon fishes, sunflower oil). Keep in mind that the effect of taking coenzyme Q10 becomes visible only after several weeks so if you are on a weight-reducing treatment you should keep taking it throughout the whole program. “Take vitamins when on a diet” – this advice is highly recommended for anyone who has resolved to limit his nutrition habits in order to slim their body or who is on a diet due to medical counsel. Thus, medical studies show that in order to replace the body’s need in vitamins and minerals one’s daily food intake should be about 5000 kcal. Furthermore, the better part of this food ration should be constituted by vegetables, cereals, meat and fruits. Obviously, it’s no use talking about losing weight when your food energy value is so high. Therefore my system presumes consumption of vitamin complexes which provide the body with all the required minerals, micronutrients and vitamins. The body’s full-time functioning as well as quite a few of its internal processes cannot go without minerals and vitamins. This is not at all surprising since vitamins play one of the most fundamental roles in the functioning of the body. 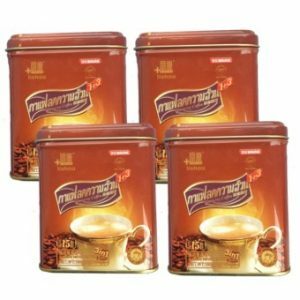 It is the presence of vitamins and minerals which facilitates your weight loss progress. 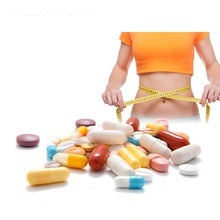 Dietitians have clinically demonstrated that taking vitamins can improve and accelerate the process of losing weight. In addition to that, nutrient complexes help protect the body from the influence of various adverse factors (environment, stresses, infections, just to name a few). Vitamins boost your immune system and increase working capacity. Opt for GMP-certified vitamin and mineral complexes whenever possible (GMP – Good Manufacturing Practice). Such complexes are much more effective than their synthetic counterparts which you will see for yourself in a little while. The state of our health is based on the correct functioning of a very complex and fundamental biosystem with a great number of connections and interdependencies. Many types of vitamins and minerals are not manufactured by the body itself and can only be obtained from outside sources. Keep that in mind at all times! Never take any vitamin pills on an empty stomach. Vitamins are absorbed properly only when taken in combination with amino acids from protein-rich food. But nutritional supplements are not the only “little helpers” for effective weight loss. You’ll also need various gadgets, accessories and apps. Thankfully, nowadays there are lots of them, and they’re widely available. In the next post you can find out which of them are the best for slimming.